That resonant question undergirds “Reversible,’’ an exploration of the role family history plays in the shaping of individual identity that was written, directed, and choreographed by the gifted Gypsy Snider. Inspiration for the show struck Snider two years ago as she was musing about her own forebears while she hung laundry on a clothesline outside her cabin in the Berkshires. “Reversible’’ seeks to build an intergenerational bridge between past and present, then and now. The construction materials, if you will, are the amazingly flexible bodies of the performers in The 7 Fingers, a contemporary circus troupe that Snider cofounded and where she serves as artistic director. Thanks to the intrepid folks at ArtsEmerson, the presenting and producing organization based at Emerson College, Bostonians have had ample opportunity over the last several years to experience the work of The 7 Fingers. “Reversible,’’ now at the Cutler Majestic Theatre, affirms yet again that the collective virtuosity of this troupe is something to see — and, crucially, to feel. However stylized their poses and unattainable their skills (for us mortals, anyway), The 7 Fingers always make you feel like a welcome guest at their party. Theirs is a gratifyingly inclusive and democratic artistry. During last year’s “Cuisine & Confessions,’’ for instance, performers prepared banana bread onstage during the show and then distributed it to the audience. No comestibles are forthcoming in “Reversible,’’ but you’re not likely to care because what is happening onstage is so hypnotically beautiful; it works on both an aesthetic and an emotional level. 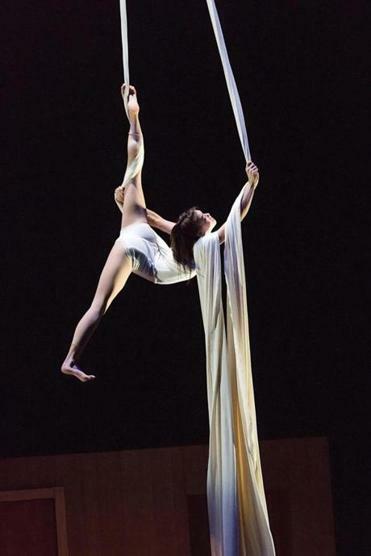 Throughout “Reversible,’’ the cast performs intricate, perfectly coordinated, frequently astonishing displays of acrobatics and aerial stunts, punctuated by dynamic dance movement. Even the set (designed by Ana Cappelluto), a scuffed, off-white building façade, moves around a lot, as the performers scamper and hurtle through its doors and windows with a celerity that would make Buster Keaton smile. Earlier shows in Boston by The 7 Fingers have been linked to states of mind (the psychological journeys of “PSY,” the relationship between food and memory in “Cuisine & Confessions’’), states of being (the exploration of the “other’’ in “Sequence 8’’), or the state of the world (the jaunty post-doomsday scenario of “Traces’’). After her backyard burst of inspiration two years ago, Snider instructed troupe members to begin conversations with their parents and grandparents about their ancestors. Then she devised visual narratives that grew out of the stories gathered by her cast: Patterson, Vincent Jutras, Jeremi Levesque, Emi Vauthey, Julien Silliau, Emilie Silliau, Hugo Ragetly, and Maria Del Mar Reyes Saez. For instance, Vauthey’s Japanese grandmother fled an arranged marriage in Japan and ran away with a man from Switzerland — an episode evoked in “Reversible’’ by a sketch in which Vauthey struggles within the layers of a billowing wedding gown. Other routines are less literal: After we learn of Julien Silliau’s grandfather, a boxer who gave up the sport and later developed Alzheimer’s disease, Silliau spins faster and faster on a German Wheel, whirling at impossible angles and seeming, with his passion, to rage against the dying of the light. Silliau teams up with his wife, Emilie, for exploits executed well above the stage on a Chinese pole that culminate with him grasping the pole with only his legs while she stands on his head, balancing there with no other support. At one point, Emilie Silliau (aloft on a rope) and Vauthey (aloft on aerial silks) engage in simultaneous routines that seem both competitive and collegial. In another routine, when Vauthey twirls three hoops around her torso and then around her extended leg, the flashing gold creates a dazzling image. By comparison, the final scene is built on the most humble of domestic materials. It’s a byproduct of that moment when Snider was hanging laundry in the Berkshires two years ago, and it absolutely pierces the heart.